OK, I made the bike cut off and now I just had to run a marathon…yes JUST run a marathon…right. I raced into transition, grabbed my bag and went to change. I had 10 mins to get onto the course, 5:40 was my cut off and I was going to make it. I decided not to change everything, just my shorts and socks, put on my shoes, hat, race belt and empty water belt and ran out of transition, I was out of transition in 3:38 and it was so fast I forgot to take off my cycling gloves, duh. Kory was there again giving me advice and support, her parting advice was to drink the soup, it was the best advice ever. I did not take time to fill up my water bottles in transition so I stopped at the first aid station to fill up and walked up the first hill. My plan was to run 5 mins and walk one min and I tried, I really tried but I could not run. I had played Ironman math before the race so I knew what paces I needed to make but let me tell you, even a numbers person has problem doing math at this stage, especially in the heat. I ran when I could and walked when I needed too and tried to keep an 8:45 pace. I was hot, really hot and I kept putting ice in my top and using sponges to cool down. I knew I needed to stay hydrated and keep up my salt and electrolytes so I kept drinking and fueling, I even had the Cola on the course for instance sugar. The first part of the run is hilly and I was suffering but I was still moving forward. I saw most of my friends on the run and I saw Neale. I was happy to see him as I had not seen him since before noon. I did not know that he was having a bad run, he looked happy. Neale is a great runner and cyclist and I knew once he finished the swim he would be great. He had a fabulous bike leg but was suffering on run, he was having knee issues and a wrong clothing choice was causing him problems. I kept going, running when I could on my way to see Barbara at aid station 10, Barbara, Ken and Reid where volunteering and I was looking forward to seeing them. I was feeling a bit better by the time I got there and I chatted with them and headed for the turnaround point. I have to say, a lot of the run is still a blur, I just kept going as I knew I had another cut off looming, I had to be done my first loop by 9pm. I played leap frog with Kory’s friend Diane and her guide Cheryl for a while, she was so happy and it was inspiring to be around her. Eventually I was running more than walking but I was still slow but I managed to drop my pace to 8:40 until I had to make a bathroom stop. I saw Anita and I asked her what side of midnight was I on, the Ironman Athletes tracker gives a predicted finish time and I wanted to know if I was on pace to finish. Like I said, don’t do math during an Ironman, it is hard, I was happy she said I had time in the bank, as it turned out I would need it. I made it to the run special needs (20K) at 8:30, I had made another cut off and once again Kory was there to help me and offer advice and support. I picked up more fuel and Cytomax, tied my long sleeve t-shirt around my waist and headed off again, I had less than 3 ½ hours to do my last half marathon. By this time I was really tired and I could not run at all. I had walked a half marathon in 3:15 before but that was on fresh legs, I knew this would be tight. I saw Neale heading back in on his final loop and I told him I did not think I would be able to finish in time. It was the first time I voiced that thought on the run, I was really scared of not finishing in time. I kept walking and I kept getting more tired and I was slowing down, slower then I needed to make the cut off. I could not make myself go faster, my thoughts were confused and I felt like I was in a fog. I probably looked like it as well as Medical kept asking me how I was feeling at each aid station and I kept smiling and saying I am fine while thinking walk fast so they don’t stop you. I saw Barbara and another FB friend Cathy at aid station 10 again and I told her I was afraid I would miss the midnight cut off. I had another cut off I needed to make first, I had to be at the turn around by 10:30 but I was worried about midnight more. I kept walking and halfway to the turnaround I saw Kristine walking back, she told me I would finish in time (or something like that) and I said I did not think I would make it and she should keep going and be an Ironman for both of us. Again I was at the bottom of that dark pit and I kept trying to climb out, it was dark, I was alone and I was so tired. I kept saying only I had the power to do this and if I wanted this enough I would have to run. I made the turnaround off by 20 mins, I sense a theme here, and kept on walking. I was not giving up yet, I was going to walk as fast as I could and keep trying. It was really dark on the path between the flood lights and all of a sudden this man was beside me, it was Ken who came out to find me. He wanted to see what I would need at the aid station so they could have it ready for me. Just before the aid station Barbara joined us and we talked a bit. I know I was really tired and probably not making a lot of sense but they kept talking and I kept walking. After the aid station Ken stayed with me, talking, keeping me moving, running when I could and just being there, I was no longer alone. 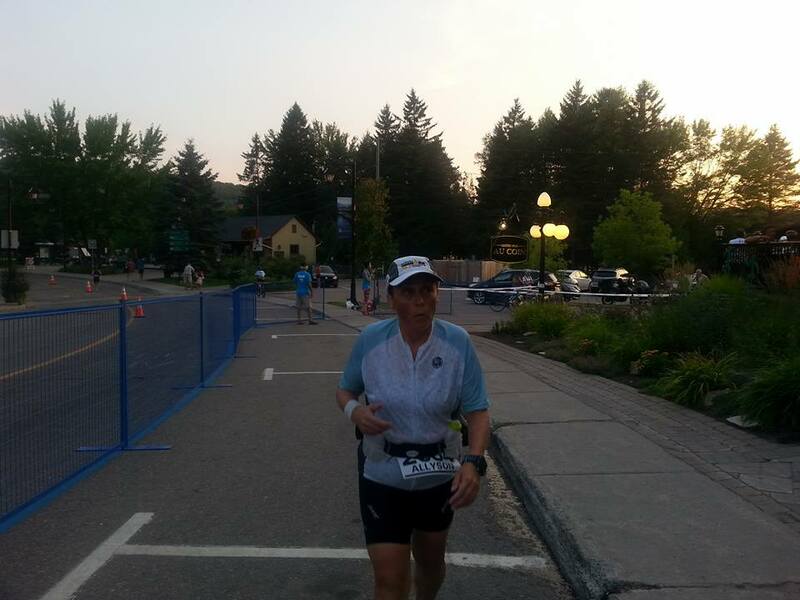 Barbara joined us and said they would stay with me and keep me on pace, they were doing the Ironman math I could not do and I kept moving forward. I started to have trouble with my left shoe again, the insole started to move again like at Musselman and I knew I did not have time to stop and keep fixing it. We tried to fix it and eventually Barbara just said take it out, it was not helping me (why did I not think of that) and I kept on walking. That 5k was my slowest and for the first time I was on the wrong side of the midnight cut, Barbara and Ken tried to stay positive, I was struggling and the though came to me I would be a few minutes before or a few minutes after midnight, it would be close. Around the 37k point my friend Stephane appeared, he had come out to find me and make sure I finished. He was there to apply tough love and I needed it, he said I needed to run and I needed to run now if I wanted to make it. Ken, Barbara and Stephane ran and I followed behind, I walked up some hills, I did not want to run and every time I said that they were there to remind me I had to. Stephane said it might have been his fault I was there (see Part 1 for that reference) but it would not he his fault I did not finish (or something like that) and that if I did not make the cut off I would have to be in line the next day to register for 2016, yeah right. Neale had come out on the course to find me and was surprised to see me running, he knew I was in good hands and took a ride to the finish line to wait for me. Everything is a bit of a blur at this point, I was tired, I was hot and I was running, as fast as I could because finishing a few minutes after midnight was not an option. I remember passing the Angels and they did not join us, Ken said even they knew I would make the cut off because they only run with the last place person. There are 2 hills at the end of the course and they were so hard, I walked up them quickly, the volunteers on the course cheering for me all the way and everyone encouraged me to finish. I could not have gotten through the last 5k without Barbara, Ken and Stephane, they are the reason I made the cut off in time, they pushed, they supported, they encouraged and they stayed with me all the way to the finishers chute. Suddenly I was there, the finishers chute was in front of me and I could not stop to until I reached the end because if I did I might not be able to start again. My final 5k was my fastest of the whole run, I had dug deep and I had nothing left, I gave everything I had and more to finish. I had dreamed of crossing the finish line for so long and now here I was and I don’t really remember it. I heard Mike call me an Ironman, I ran across the finish line, Kory, Pedro and Sylvie where there to catch me as my legs gave out and I was swept into Medical before I knew what was happening. Quickly I was hooked up to a heart rate monitor, a blood pressure cuff; I had my blood sugar taken, my temperature taken and ice applied. I asked for Kory to come in and asked her to tell Neale I was OK, I did not want him to worry. Medical was asking me all kinds of questions and all I could think was I did it, I was an Ironman. I kept looking at my medal, I could not believe I did it; it was so close to going the other way. Finally Medical released me and I went to find my family and friends, everyone was there, crying and of course I started as well. They were all so worried I would miss the cut off and then worried when Medical scooped me up. We had done it, Neale and I had become Ironman finishers together, well he was several hours before me but I am use to that. I finished 3 minutes and 33 seconds before midnight, my final time was 16:56:27 and was the last person to cross the finish line before midnight. I had cut it close but that was OK, as I always said I would be happy with anything under 16:59:59. Thanks, it was a long tough day and I am very happy with my result.